Meandering garden path bracelet By Penny Dixon - Made up of crystals, seed beads, and two-hole tile beads, the cute domed components in this bracelet zigzag like textured stone in a cottage garden. Quick and easy to stitch, this design will put you on a path to (almost) instant gratification. Rose petal posy By Sandie Bachand - It's a no-brainer to make flowers with Czech glass rose petal beads, but the trick is structure. Several systems of hidden support, including two-hole Czech Mate tile beads, keep this posy perfectly arranged. 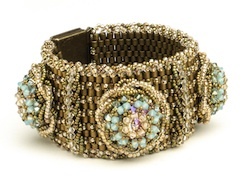 Ageless sophistication By Cary Bruner - This cuff-style bracelet is all elegance, from its ornate box clasp and wide, supple odd-count peyote band to the glittering rivolis that peek through rounds of bicones and layered loops of seed beads. Choose colors you wear the most for an all-occasion accessory! 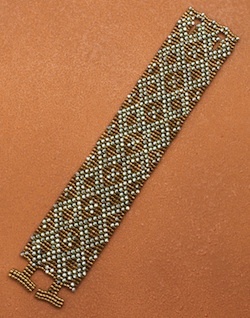 Riveting geometric bracelet By Lynne Soto - Square stitch never looked so good! Cylinder beads form the background of this geometric design, and peanut beads lend the look of small rivets. 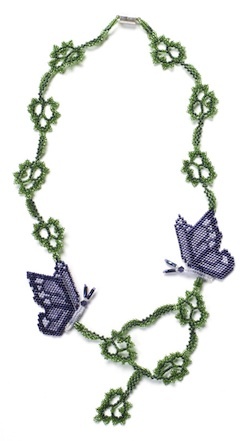 Butterfly garden necklace By Dessislava Vaughan - This necklace combines your favorite beading stitches: peyote, herringbone, bead weaving, and brick stitch. 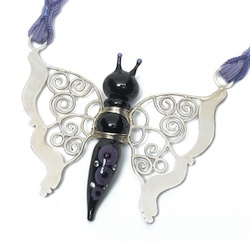 The butterfly and leaf components are versatile, so make the necklace as directed, or let your imagination take wing with a brambly bracelet or butterfly brooch. 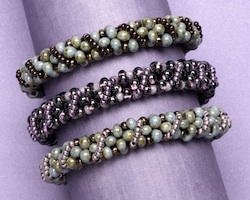 Octagon allure By Cathy Lampole - Use modified right-angle weave to construct the sides of this bangle and connect them along their inside edges. Then get ready for a pop of color! Choose bright bicones or a more monochromatic hue to finish. Victorian embrace By Sylvie Camps - The ornate bead caps and netted bezels in this bracelet are reminiscent of the Victorian era. 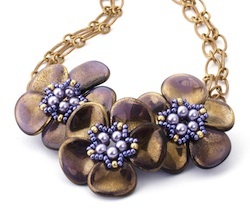 But when combined with gemstone beads, the piece takes on a modern appeal. 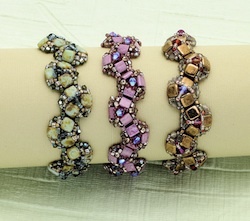 Stepping stones By Diane Fitzgerald - Get a sneak peek at the inspiring styles of the Swarovski ambassadors! 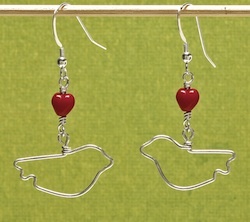 Pretty bird earrings By Julia Gerlach - Make your own bird charms with simple wirework skills, and assemble them into sweet, swingy earrings. Diamond decadence By Regina Atkins - Using modified right-angle weave get the glow of diamonds with Swarovski cup chain, faceted briolettes, and few unexpected elements, like bugle beads and peanuts in this elegant necklace. 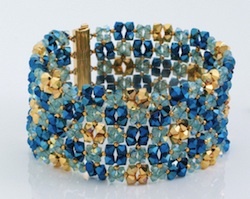 Bubble Wrap bangle By Leslie Rogalski - Embellish a crossweave bangle that's flexible and easy to roll on. Large farfalle beads (sometimes called peanut beads) stitch up quickly to create the base for this bangle, and seed bead accents offer a pop of color. With a few adjustments, you can make this bracelet with a clasp. 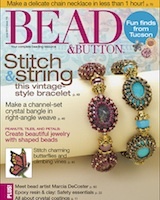 Bead Soup - Diane Fitzgerald writes the Handy-Dandy Guide to crystal coatings, read about cool stuff from The Tucson Gem & Mineral Show, and book reviews. 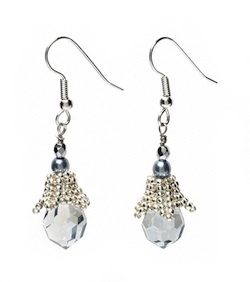 Dewdrop dangles By Jane Danley Cruz - Crystal drops, herringbone bead caps, and a few accent beads are the recipe for this elegant earrings. 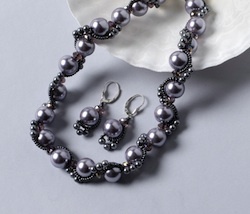 Sea strand By Sue Neel - Use a unique bead-weaving technique to fashion a necklace and earrings from large pearls, sparkly rondelles, seed beads, and smaller pearls. 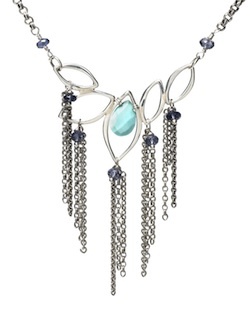 Cascading chains By Marcy Kentz - Delicate chain, a gemstone drop, and faceted beads stream down from a silver pendant. Artist Spotlight: Christi Klein - An artist since birth, Christi Klein can't sit still unless her hands are busy. a spoustu jiných zajímavých věcí!